More than 100 Indigenous surfers from across the state gathered to celebrate the 21st annual event, which brings together Indigenous communities in a fun weekend celebrating surfing and Indigenous culture. The event was opened on Saturday by Wauthaurong Elder Corrina Eccles and cleansed with a traditional smoking and mixing of the waters ceremony. Early rain showers didn't dampen the spirits with participants taking to the water in learn to surf water safely sessions. In the afternoon, competition got underway with all junior divisions finalised, along with Open Women and Masters Women. The Tag Team event was contested between Victoria Police, Department of Justice, Strong Brother Strong Sister, CFMEU and Wathaurong Men’s Group. After a high scoring and exciting battle, Strong Brother Strong Sister secured the win on the final wave of the heat. Sunday saw a larger improvement in weather and ocean conditions, with a clean swell, light winds and sunny skies. After qualifying rounds on the previous rounds, both the Open and Masters Men’s finals were contested. Utilising powerful forehand carves, Red Hill‘s Rhys Collins claimed both divisions, gaining a wildcard into the Rip Curl Pro Trials at Bells Beach from his performance in the Open Men division. 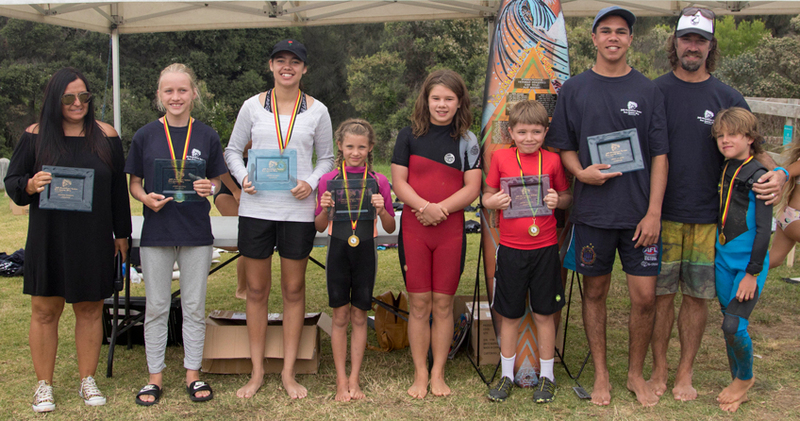 Wathaurong Encouragement surfboards were awarded to Alla Purcell (MacArthur) and Grace Tournier (Geelong). Strong Brother Strong Sister Encouragement Surfboards went to Destiny Murphy (Latrobe Valley) and Harry Chatfield (Warrnambool). Sissy Howelle (Geelong) and Olly Hickey (Winchelsea) were presented with the Department of Justice Good Sport Awards. Communities represented at the event included East Gippsland, Portland and the South West, Koroit, Bendigo, Ballarat, Shepparton, Metropolitan Melbourne, Bass Coast, Mornington Peninsula, Latrobe Valley as well as Geelong and the Surf Coast. A welcome addition to the event, was the contingent from the Melbourne Indigenous Transition School (MITS). These participants included members from the Northern Territory, who despite the climate change brought great energy to the event. The Woorrangalook Victorian Koori Surf Titles is presented by VicHealth and Play It Safe by the Water and Supported by Wathaurong Co-Op, Wathaurong Glass, Wadawarrung, Narrana Corangamite Catchment Authority, Colac Shire Council, CFMEU, Parks Victoria, Strong Brother, Strong Sister, Department of Justice, ONABAC, Vitality Brands, Cancer Council, Strapper, Modom, Ghanda, Air Asia and Surf Coast Bin Hire.